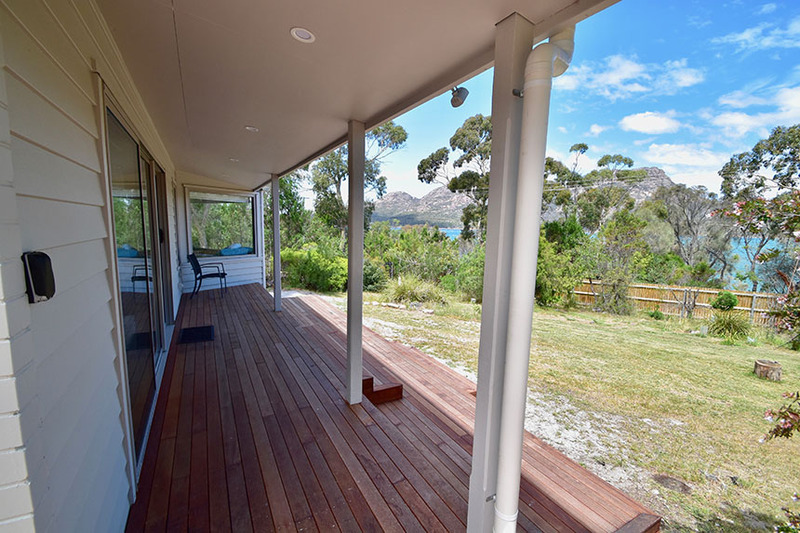 Driftwood at Freycinet is set in a stunning virtual waterfront location that looks out onto The Hazards mountain range. 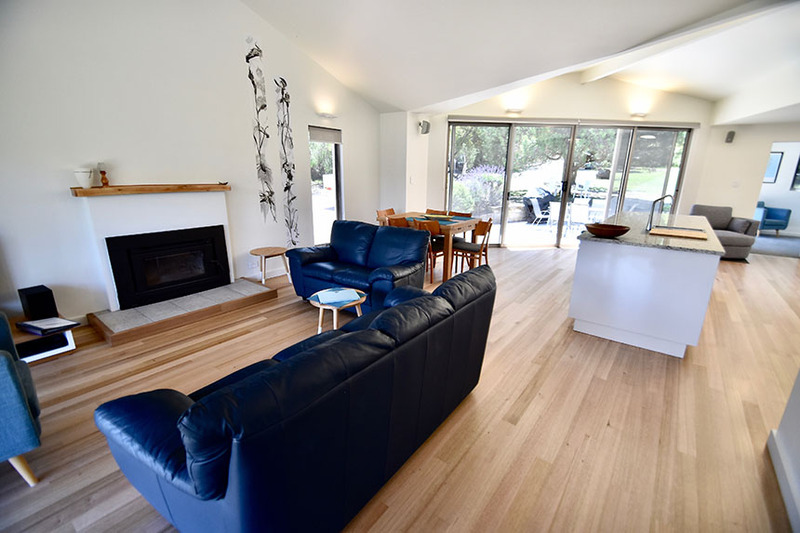 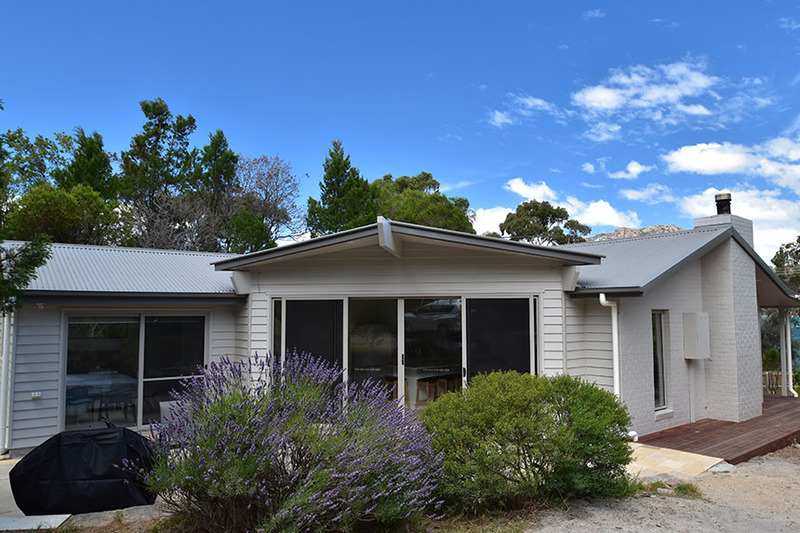 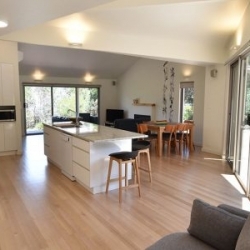 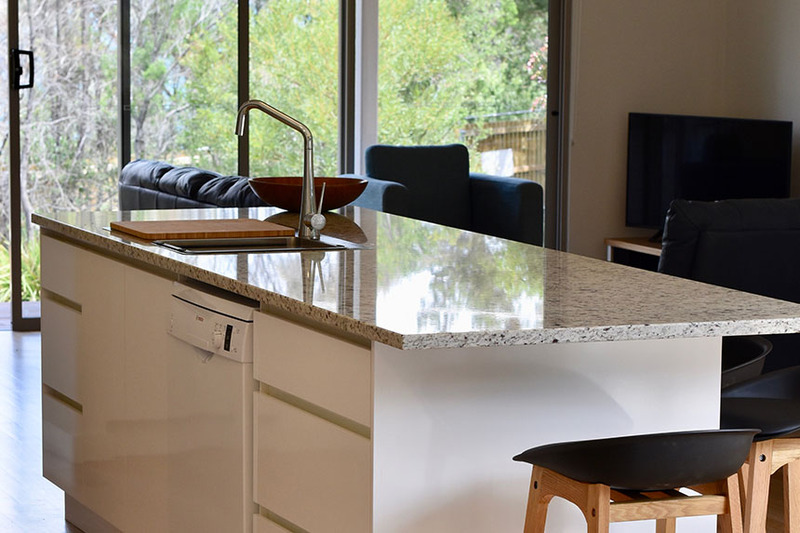 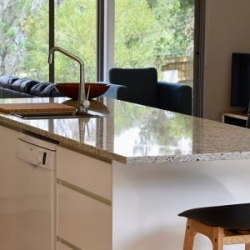 Stay in our architecturally designed, cleverly renovated beach holiday home to enjoy the best of Coles Bay in contemporary comfort and style (such as free high speed wifi, USB charging ports, coffee machine, heated bathroom floors etc). 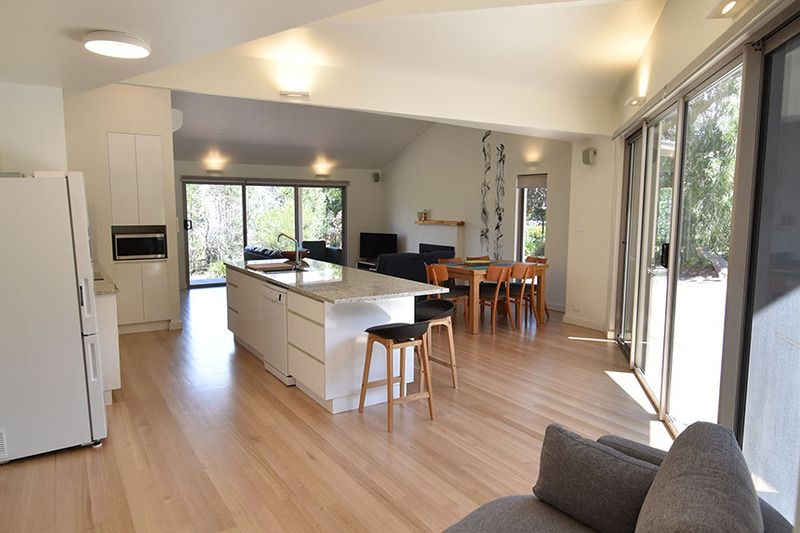 Originally built in the 1970s and extensively renovated in late 2017, the real luxury of Driftwood is its setting – a huge private block with mature trees and privacy by the water. 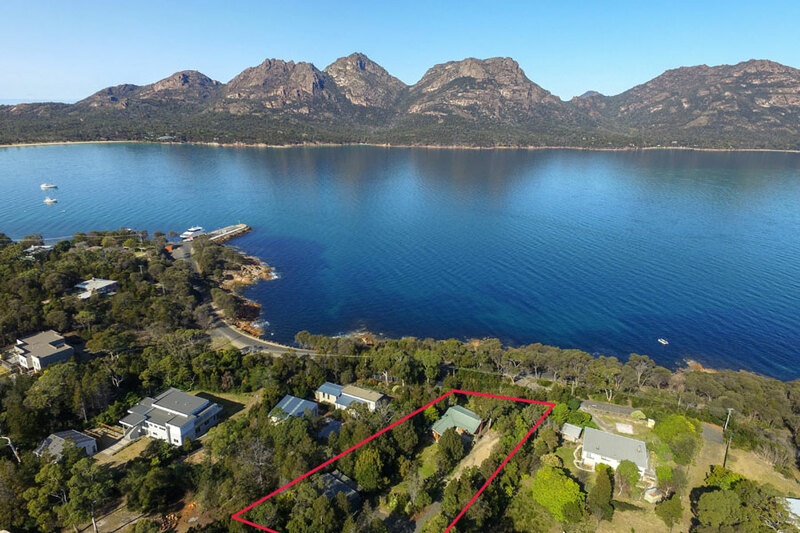 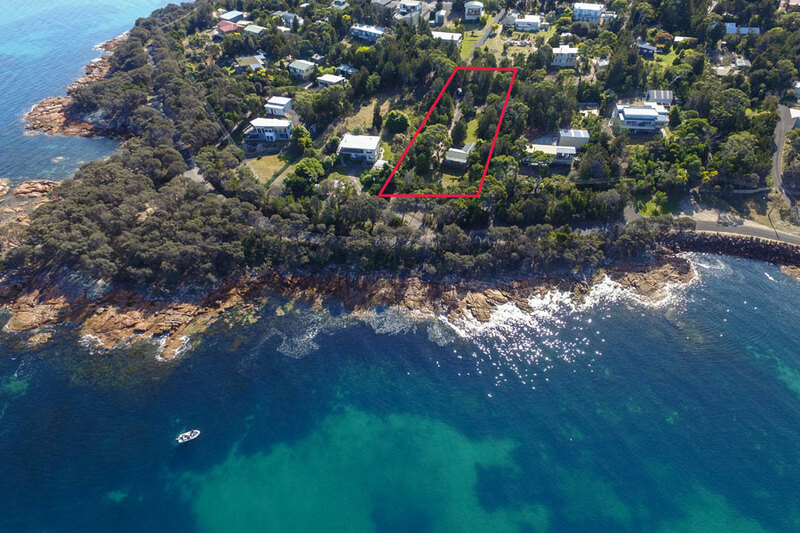 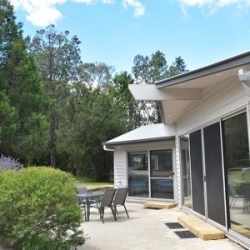 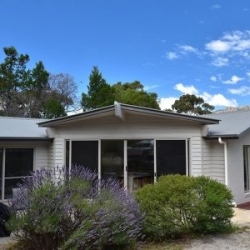 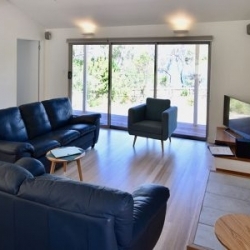 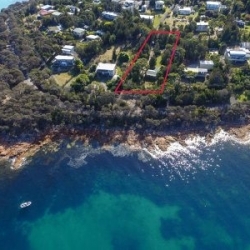 Walking distance to restaurants, cafes, shops and Wineglass Bay Cruises, it is a short drive to the Wineglass Bay walking track car park and many other local attractions in this region. 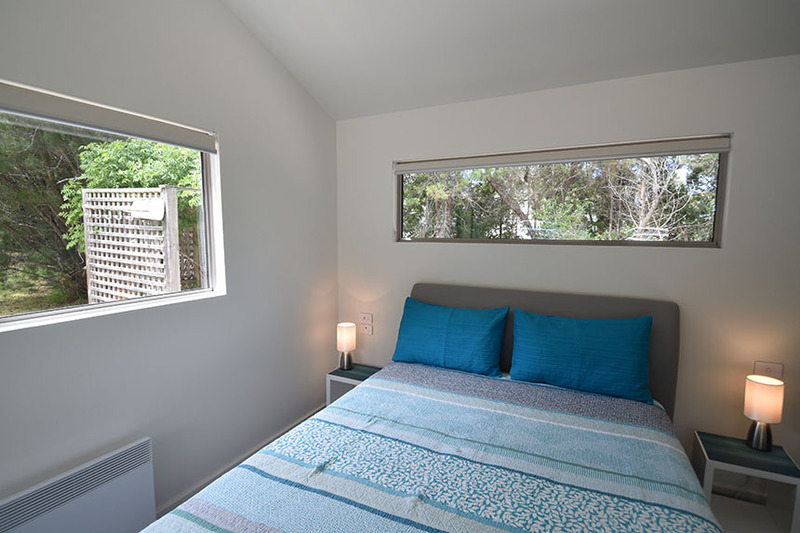 Driftwood has two bedrooms. 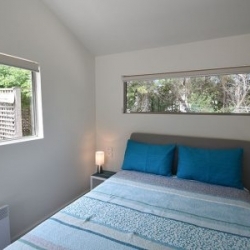 Each has a queen-sized bed and its own ensuite bathroom, so the house accommodates 2 couples. 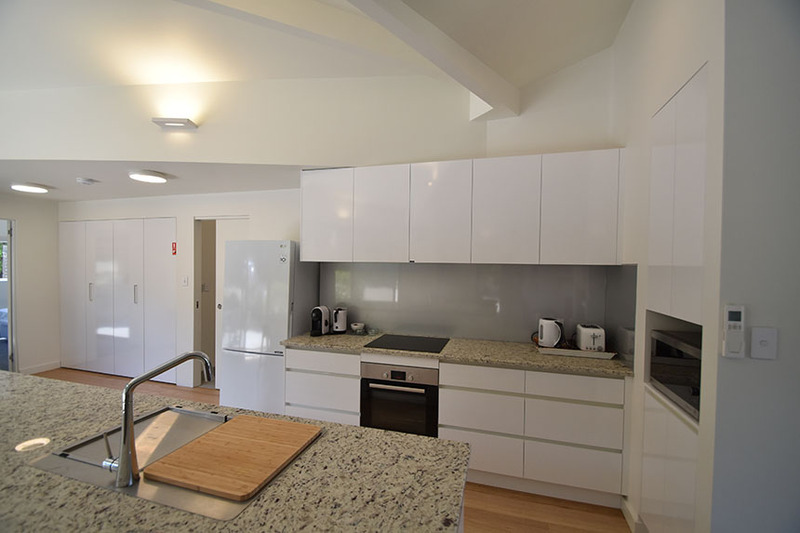 It has a fully equipped kitchen with everything you need and comfortable furnishings throughout. 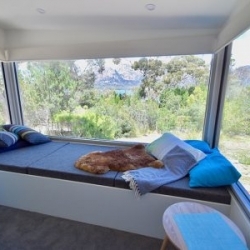 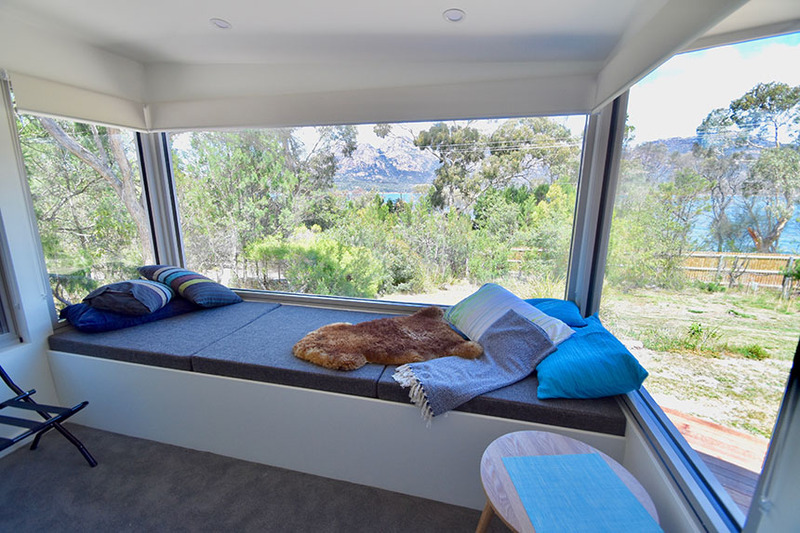 Made for relaxing, one bedroom has a very large window box – the perfect place to curl up and watch the sun rise and set, changing the colours of the Hazards mountains. 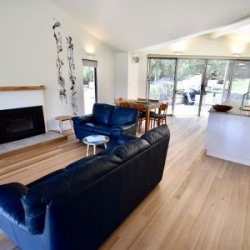 The house has been designed for comfort in all seasons. 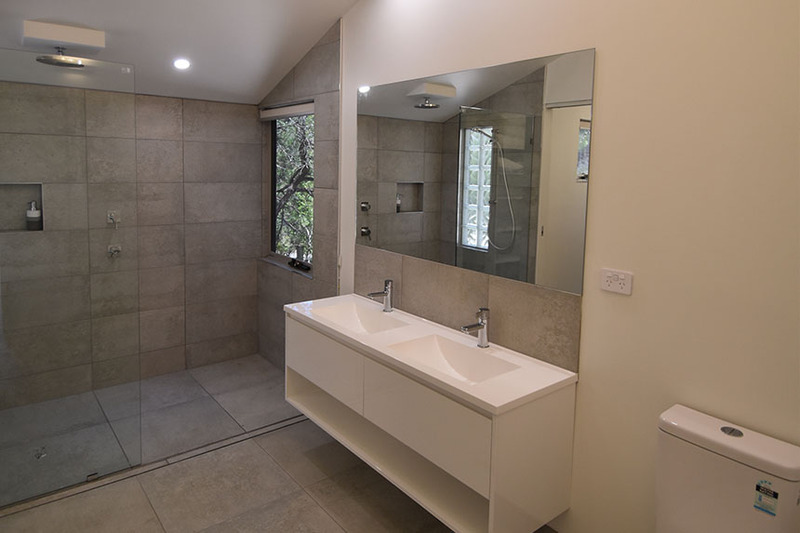 Reverse cycle and wall panel heating, plus underfloor heating in each bathroom creates instant comfort while the wood heater is there for relaxed long winter evenings. 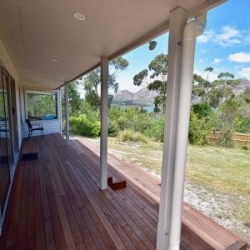 There is also a wide front decking for easy living looking onto the water or to enjoy the stars at night. 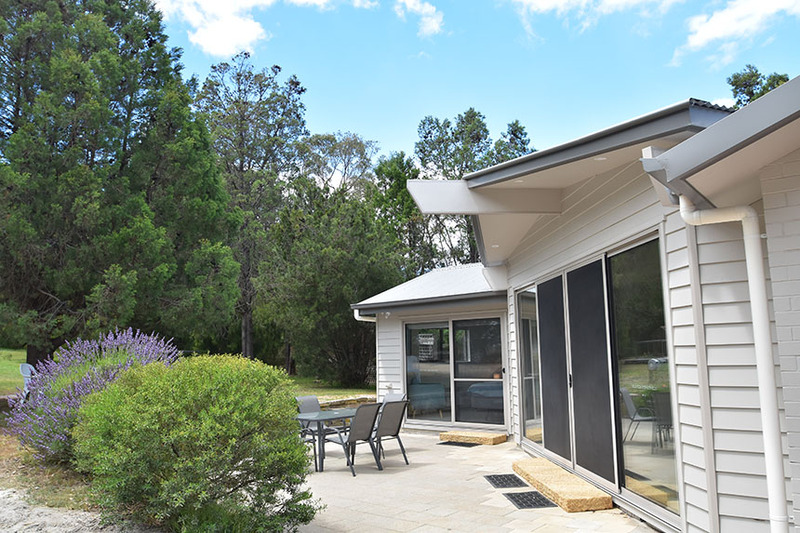 A sun-drenched, private entertainment courtyard at the back is for BBQs or just to sit and relax and take in the sounds of the sea, birds and breeze. 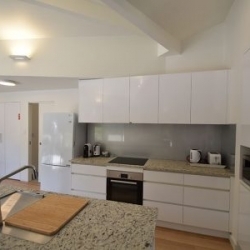 It also has a completely flat entrance and no internal steps, making it easier for people with limited mobility. 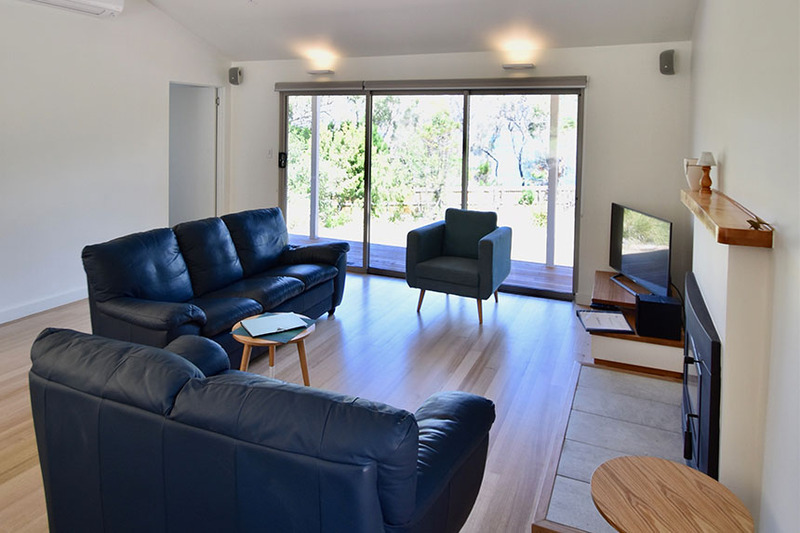 A perfect place for couples, families and friends. 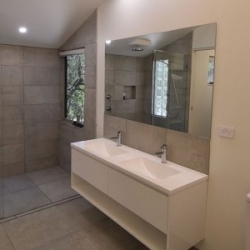 Birds, trees, stars, views, water and space!